119143_01 Robyn with her work "solitary man". THE OPENING of two exhibitions was held last week in Brimbank in honour of the 100th anniversary of World War I and Sunshine’s historic military sacrifice. “My Father’s Legacy” an exhibition by Sunshine resident Robyn Sims would run along side “Remembering: 100 Years On – In commemoration of the outbreak of World War I”. Ms Sims exhibition was a testament to the passion for drawing instilled in her by her father, who had fought in World War II, and included her father’s paintings which he had sent to her mother and aunty from New Guinea during the war. Ms Sims said she felt privileged to share her father’s work with the community. “I always enjoyed drawing with my dad,” Ms Sims said. And 10 years ago, with the gift of an oil paint set from her daughter-in-law, Ms Sims passion for watercolours and painting flared. She attended paint classes and continued to be inspired by the works of her father. 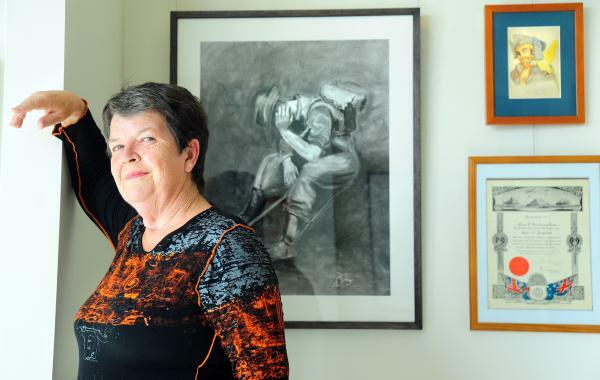 Now her watercolours and paintings are being exhibited side by side to her father’s sketches and water colours at the Hunt Club Community Arts Centre until 4 May. “He never got any recognition – he came back from the war very sick and he worked,” Ms Sims said. Ms Sims said that although her father never talked about the war she felt his experience had still affected her. “It’s the rippled effect of war, and it’s still going on,” Ms Sims said. Her works include her drawing of a solider and another of the children of New Guinea looking bewildered and confused about what was happening in their country.